My newest obsession is listening to podcasts on my commute. I know I'm probably late to the podcast game, but I also know there are still a lot of people out there not taking advantage of this free entertainment! 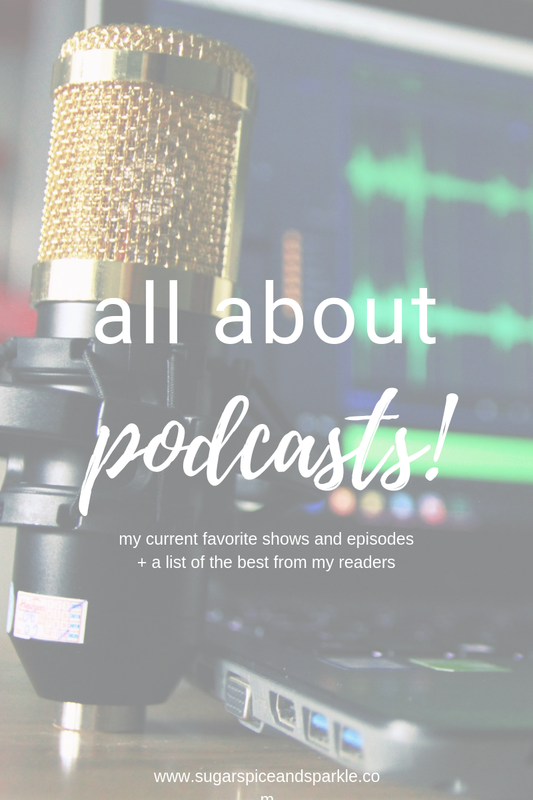 It seems like every time I turn around someone is starting a new podcast, so I decided to share my favorite shows, and a few specific episodes that have stood out for me. When I polled y'all on Instagram to see how much interest there would be, one of my friends suggested I also share your favorite shows! So that list will be at the end, by category. Let's get started with the shows I personally listen to - for these I can provide a brief description and my personal thoughts! As a blogger, I love listening to business podcasts and one has led me to the next when different hosts are guests on other shows! The Goal Digger Podcast (Business) - This podcast is hosted by Jenna Kutcher, who I've followed for probably years at this point. I found her through one of her classes on growing your Instagram following. She has tons of boss ladies on her show who share their stories and I always feel inspired to kick some serious business booty after listening to an episode! RISE Podcast (Business) - This podcast is hosted by Rachel Hollis, whose book "Girl Wash Your Face" I am currently reading. Rachel is a really straight forward person which has made me love her self-help book. This podcast is in a similar vein to Jenna's but I enjoy hearing from a personality type more similar to my own. I haven't listened to as many episodes of this one, but the ones I mention below BLEW me away! That's all for me right now, it's already a lot to keep up with considering most episodes are an hour and my commute is only 20 minutes each way! Now onto your suggestions, some of which I am very interested in! Keep in mind I haven't listened to any of these yet myself so if they aren't good don't blame me ;) JK you guys all have amazing taste, I just know it! Thank you so much if you sent me your recommendation! I can't wait to listen in, How I Built This and Armchair Expert are on the top of my list. Let me know of any other good ones in the comments below, and also if you liked this type of post, a little different than my norm.